Colloidal semiconductor nanocrystals irradiated with ultraviolet light. Quantum confinement causes the band gap energy to vary with the nanocrystal's size. Each vial contains a monodisperse sample of nanocrystals dispersed in a liquid solvent. Quantum dots are parts of matter whose excitons are bound in all three spatial dimensions. An exciton is formed when a photon (light particle) is absorbed by a semiconductor. To put it simply, a quantum dot is a nano-scale semiconductor that captures light and converts it into energy. Since they are very small, quantum dots can be applied to surfaces such as plastic by just spraying it to form a flexible layer of quantum dot nano-film semiconductor. This allows the production and manufacture of solar cells that are more economical, durable, and efficient than standard silicon based ones. Some quantum dots are even just a few atoms thick, allowing for micro-sized devices to be produced. Aside from solar cells, quantum dots are also used in transistors, LEDs, diode lasers, and even for quantum computers. Researchers from the University of Toronto (U of T) and King Abdullah University of Science & Technology (KAUST) have made a breakthrough in the development of colloidal quantum dot (CQD) films, leading to the most efficient CQD solar cell ever. Their work is featured in a letter published in Nature Nanotechnology. The researchers, led by U of T Engineering Professor Ted Sargent, created a solar cell out of inexpensive materials that was certified at a world-record 7.0% efficiency. "Previously, quantum dot solar cells have been limited by the large internal surface areas of the nanoparticles in the film, which made extracting electricity difficult," said Dr. Susanna Thon, a lead co-author of the paper. "Our breakthrough was to use a combination of organic and inorganic chemistry to completely cover all of the exposed surfaces." 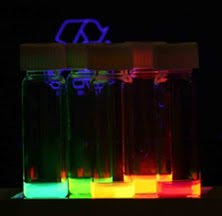 Quantum dots are semiconductors only a few nanometres in size and can be used to harvest electricity from the entire solar spectrum – including both visible and invisible wavelengths. Unlike current slow and expensive semiconductor growth techniques, CQD films can be created quickly and at low cost, similar to paint or ink. This research paves the way for solar cells that can be fabricated on flexible substrates in the same way newspapers are rapidly printed in mass quantities. The U of T cell represents a 37% increase in efficiency over the previous certified record. In order to improve efficiency, the researchers needed a way to both reduce the number of "traps" for electrons associated with poor surface quality while simultaneously ensuring their films were very dense to absorb as much light as possible. The solution was a so-called "hybrid passivation" scheme. "By introducing small chlorine atoms immediately after synthesizing the dots, we're able to patch the previously unreachable nooks and crannies that lead to electron traps," explained doctoral student and lead co-author Alex Ip. "We follow that by using short organic linkers to bind quantum dots in the film closer together." Work led by Professor Aram Amassian of KAUST showed that the organic ligand exchange was necessary to achieve the densest film. "The KAUST group used state-of-the-art synchrotron methods with sub-nanometer resolution to discern the structure of the films and prove that the hybrid passivation method led to the densest films with the closest-packed nanoparticles," stated Professor Amassian. The advance opens up many avenues for further research and improvement of device efficiencies, which could contribute to a bright future with reliable, low cost solar energy. According to Professor Sargent, "Our world urgently needs innovative, cost-effective ways to convert the sun's abundant energy into usable electricity. This work shows that the abundant materials interfaces inside colloidal quantum dots can be mastered in a robust manner, proving that low cost and steadily-improving efficiencies can be combined."